Be the first to share your favorite memory, photo or story of Jeannie. This memorial page is dedicated for family, friends and future generations to celebrate the life of their loved one. 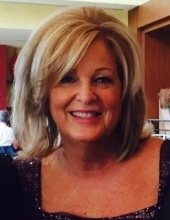 Jeannie Murphy-Mittal, age 65, a resident of Naperville, IL since 1987, formerly of Palos Heights and Peoria, IL, passed away on Tuesday, March 19, 2019 at her home. She was born November 11, 1953 in Evergreen Park, IL. Beloved wife of James T. "Jim" Mittal, whom she married March 16, 1984, loving mother of Matt Mittal (Emily), Brett Mittal (Stephanie D'Ercola) and Benjamin Mittal (fiancée, Chelsea Nusslock), step-mother of Jamie Baltrotsky (Mike), adored grandmother of Ava Mittal; Madeline, Olivia and Molly Baltrotsky, devoted daughter of the late Philip F., Jr. and Jean Therese (nee Cain) Murphy, dear sister of Philip Murphy III (Yulia), Michael Murphy (Debbie), the late Susan "Suzie" Murphy, Eileen Murphy-Amlee (Duane), Sharon Richardson (Tim), Mary Castle (Kent), and David Murphy, dear sister-in-law of Jean (William) Troy and the late Judy (Jim) Troy, niece, cousin, aunt, great-aunt and friend of many. Jeannie grew up in Palos Heights, attended Harold L. Richards High School in Oak Lawn, IL (Class of 1971) and was a graduate of Chicago State University with a BA in Psychology. She worked as an account executive at WHOI television station in Peoria, IL and later, after moving to Naperville, as a realtor at Ryan Hill Realty and currently at Baird & Warner, both in Naperville. Jeannie was a member of St. Elizabeth Seton Catholic Church and served on the Board of Directors at Naperville Responds for Our Veterans. She was past president of Naperville Central High School Redhawk Hockey Association and past president of West Suburban Irish. Jeannie was a member of Illinois Valley Yacht & Canoe Club (IVY) of Peoria and was a loyal fan of the Chicago Blackhawks. Visitation will be Monday, March 25, 2019, 4:00-9:00 PM at Friedrich-Jones Funeral Home & Cremation Services, 44 S. Mill St., Naperville. The Mass of Christian Burial will be celebrated on Tuesday, March 26, 10:00 AM at St. Elizabeth Seton Church, 2220 Lisson Rd., Naperville. Interment will follow at Holy Sepulchre Cemetery, Alsip, IL. To send flowers or a remembrance gift to the family of Jeannie Murphy-Mittal, please visit our Tribute Store. "Email Address" would like to share the life celebration of Jeannie Murphy-Mittal. Click on the "link" to go to share a favorite memory or leave a condolence message for the family.